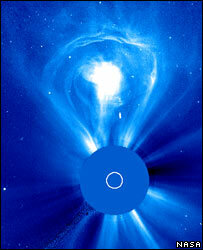 The Stereo mission will study violent eruptions from our parent star known as coronal mass ejections (CMEs). The eruptions create huge clouds of energetic particles that can trigger magnetic storms, disrupting power grids and air and satellite communications. The mission is expected to help researchers forecast magnetic storms - the worst aspects of "space weather". "Coronal mass ejections are a main thrust of solar physics today," said Mike Kaiser, the Stereo project scientist at the US space agency's (Nasa) Goddard Space Flight Center. "With Stereo, we want to understand how CMEs get started and how they move through the Solar System." The mission comprises two spacecraft, lofted on a Delta-2 rocket from Cape Canaveral, Florida. The two near-identical satellites will orbit the Sun, but one of them will move slightly ahead of the other, to provide stereo vision. Technical hitches have delayed previous attempts at launching. Coronal mass ejections erupt when "loops" of solar material lifting off the Sun suddenly snap, hurling a high-temperature (hundreds of thousands of degrees) plasma into space. The plasma is formed of electrons and ions of hydrogen and helium. A CME will contain typically a billion tonnes of matter and move away from the Sun at about 400km/s. Much of the time, these outbursts are directed away from the Earth, but some inevitably come our way. When they do, the particles, and the magnetic fields they carry, can have highly undesirable effects. "When a big storm hits and the conditions are just right, you can get disturbances on power grids and on spacecraft - they are susceptible to high-energy electrons and protons hitting them," Dr Kaiser told BBC News. "These particles are hazardous to astronauts; and even airline companies that fly polar routes are concerned about this because CMEs can black out plane communications, and you can get increased radiation doses on the crew and passengers. "If we know when these storms are going to hit, we can take preventive action." At the moment, solar observatories, because they look at the Sun straight on, have great difficulty in determining the precise direction of a CME. By placing two spacecraft in orbit to look at the Sun-Earth system from two widely spaced locations, scientists will be able look at the storms from the side - to work out very rapidly if a cloud of plasma is going to hit our planet. "In solar physics, we make a remarkable leap in understanding either by producing new instruments that have better resolution, so you can probe deeper into the Sun or see structures you've never seen before; or by going to a different vantage point," said Stereo program scientist Dr Lika Guhathakurta. "This is where Stereo comes in; it is not that its instrumentation is a breakthrough in terms of resolution, but it will see the Sun in all its 3D glory for the first time - all the way from the surface of our star out to the Earth. It's going to be spectacular." 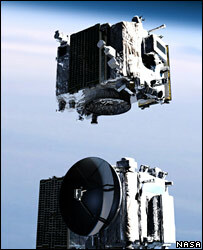 The Stereo spacecraft each carry 16 instruments. These include telescopes, to image the Sun at different wavelengths, and technologies that will sample particles in CMEs. 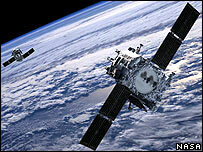 The UK has a significant role on the mission, having provided all the camera systems on board the spacecraft. 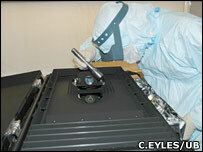 It has also delivered a Heliospheric Imager (HI) for each platform. This instrument will follow the progress through space of a bubble of plasma by tracing its reflected light. The engineering demands on the British team have been exacting. "The reflected light from these coronal mass ejections is extremely faint," explained Dr Chris Eyles of the University of Birmingham. "It is typically a [100 trillion] times fainter than the direct light from the Sun's disc, so we have to use a sophisticated system of baffles to reject that direct light. "Critical to the HI's operation has been cleanliness of assembly. If we get dust particles, fibres of even hairs on critical surfaces inside the instrument, they would scatter sunlight and destroy the performance of the instrument." The Stereo spacecraft will send their data straight to the US National Oceanic and Atmospheric Administration (Noaa), the agency which makes the space weather forecasts used worldwide by satellite and airline operators. The new information is expected to lengthen the advance warning forecasters are able to give - from the current few hours to a couple of days. With our ever increasing dependence on spacecraft in orbit - for communications and navigation - the Stereo mission comes not a moment too soon. Earth's magnetic field gives the planet and its inhabitants a good measure of protection, but with space agencies seemingly intent on sending astronauts to the Moon and even to Mars in the next few decades, there is a pressing need for a fuller understanding of the Sun's activity. Moon or Mars bases will have to be carefully designed shelters, and astronauts will need very good advice before deciding to venture too far from such protection. August 1972 saw a solar storm that is legendary at Nasa. It occurred between two Apollo missions, with one crew just returned from the Moon and another preparing for launch. If an astronaut had been on the Moon at the time, they might have received a 400 rem (Roentgen Equivalent Man) radiation dose. Not only would this have caused radiation sickness, but without rapid medical treatment such a sudden dose could have been fatal. Dr Chris Davis from the UK's Rutherford Appleton Laboratory underlined the power of CMEs. "The energy in a CME is typically about 10-to-the-power-of-24 joules. That is the same as a bus hitting a wall at 25mph a billion, billion times. It's 100 times the energy stored in the world's nuclear arsenal," he said.